Having a birthday is always a great time for a celebration and a party. There are so many things to think about when party planning. If you're planning a birthday party for a person who has reached a milestone in their life, you'll want to make it extra special. If the birthday celebrant is turning 80, you may be wondering how to make it special. After all, chances are they probably have all they need by now, but you can still make the occasion fun and festive. Think of the way our world has changed in just 80 years! Someone turning 80 now would have been born at the height of the Great Depression and only 8 years old when the whole world went to war in Europe and Asia. They would have danced the Jitterbug and listened to Bing Crosby, Jo Stafford, Frank Sinatra, Nat King Cole, Patti Page and Doris Day, and came to adulthood during the 1950’s, a time we now see through such rose colored glasses. A perfect America, when all the best was yet to come! So what would an 80 year old person enjoy? There are lots of party favors on the market, especially for those with milestone birthdays. Turning 80 is an exciting milestone for anyone. A gift of nostalgic candy makes a wonderful gift, as it has a way of bringing back childhood memories in a way that nothing else can. Anyone turning 80 will most definitely have a lot of history behind them to share. They are sure to have memories of their favorite candy they enjoyed as a child. 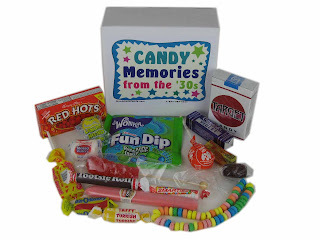 There are 80th birthday favors and candy that would be perfect for this occasion. A trip down memory lane with their favorite candy will surprise and delight as they rediscover candies of the past. Why not surprise your birthday celebrant with a nostalgic gift basket filled with their favorite penny candies from the past. Even the younger generation will delight in seeing such oldies but goodies as Lemon Heads, Necco Wafers, Teaberry Gum, Candy Cigarettes. Some may discover candy they never knew existed. Make sure you get enough for the birthday person to share with the younger generations. Another great way to make an 80th birthday special is the addition of decorations and favors for your guests. 80th birthday favors can include balloons, a fun and festive tablecloth, paper plates and cups that let everyone know the birthday guest is 80. How about a cute pair of 80th birthday glasses? Maybe even a fun hat. I bet you didn't know that the President of the United States will send a greeting card to someone turning 80. All you will need to do is to contact them at least 6 weeks in advance. But let's not forget the cake. Have fun and enjoy celebrating this special time. While you'll want to make this party extra special with family and friends, keep in mind someone turning 80 may not have the energy they once did, and may tire easily. It's their big day, so make sure they enjoy it.